The Basalt Rock Café’s wall of windows, lofty ceilings, and open air patio make it the perfect space for hosting your next event. Available for private rental after 3:00 pm daily, this space can be easily configured whether you are planning an intimate luncheon or a prime rib dinner for 100. 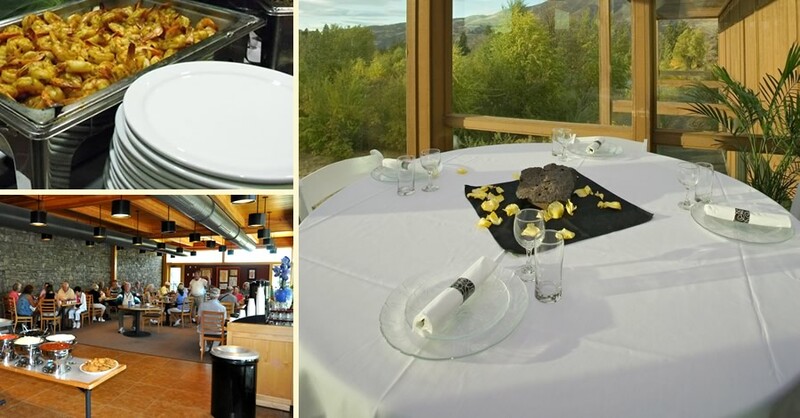 Our experienced event and catering staff will take care of all the details, from menu planning through dessert. During regular museum hours, the Basalt Rock Cafe is available by advance scheduling for groups of 10 or more. There is no facility charge for the use of the cafe from 9 am to 3 pm. Enjoy a tasty lunch while you sip a glass of local wine or craft beer and talk about the history surrounding you as you relax in the cafe or on the open air patio. ***Availability by advance scheduling only, for groups of 10 or more. Call our Events Coordinator at 541-296-8600 x 202 to schedule.